I will try to maintain a monthly update schedule. New versions of Simplified Blog Theme and Simplified Pro are live now! Five site-width settings now (980, 1280, 1400, 1600, 1920px out of the box. All responsive). The next update will be a bigger one, it will include support of several new languages as well. It will be available in 2-3 week time. Finally, recently the forums opened. You can ask questions and share your thoughts about the themes. SimplifiedBlog Theme featured at WordPress.org! SimplifiedBlog theme was chosen as one of the featured themes at WordPress.org Theme repository. Thank you everyone, who downloaded the theme. Feel free to ask any questions, I will be eager to answer and provide guidance. If you really liked the SimplifiedTheme, consider buying SimplifiedPro variant that have additional features and premium support over email. Simplified Blog theme 1.5.0 is available for download. It is our biggest update yet! The theme becomes lighter, quicker and more simplified! The whole Font-Awesome is no longer bundled. The theme is now 120KB-240KB lighter! We only include Font-Awesome icons that are displayed. Nothing more. Added minified style.css (style.min.css) to be used automatically by the child theme. Also the Simplified Pro premium version 1.0 was released based on Simplified 1.5. It has some really nice features and includes a year of premium support with each purchase. Check it out. The recommended method of customisation of themes on your blog is by using Child Themes. Child theme – is a kind of “add-on” on top of your existing theme. It can be used to replace existing files in your theme, add css or introduce new features without changing main theme’s code. The benefit of Child Themes is that you can continue to update the parent theme without risk of losing your customisations. For your convenience, you can now download a basic Child Theme for your SimplifiedBlog theme. Upload it to your blog (you should have SimplifiedBlog installed). Customise your Child Theme: add css to style.css file, add functions to functions.php. Add files you want to replace in the parent theme. The SimplifiedBlog got an update. Three templates for pages. Now you can set layout on per page basis. Just look for a page attributes>template drop-down when adding a page! Simplified Blog 1.3.9 update was accepted at WordPress.org/themes repository and is now live. Improvements concern better mobile theme (with a hiding menu on small screens) and single post title fixes. 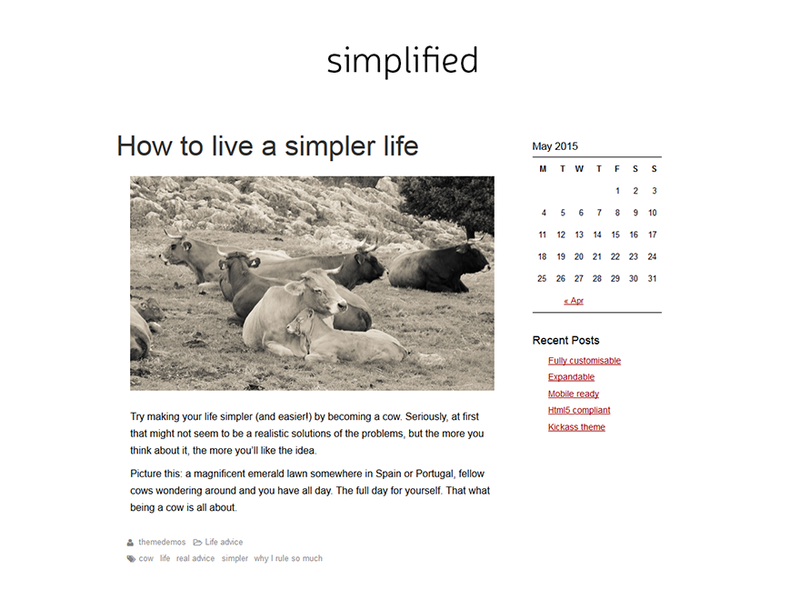 Simplified Blog theme is now available in WordPress theme repository. It is clean, simple and customisable theme for bloggers who value their time. Check out all the features of Simplified Blog. You can ask for support and paid customisation here.